Kaaya Tech’s HoloSuit, the wireless full-body VR, AR, and MR haptic and data tracking suit, has just ramped up their wearables Kickstarter campaign at AWE 2018 where they showed off their tech for the first time. They are crowdsourcing until Monday, July 30th in an all or nothing campaign to help them raise $50,000 to begin mass production of the HoloSuit smart clothing. HoloSuit’s team has created a unique line of wireless VR, AR, and MR compatible clothing pieces that are compatible with PCs, tablets, Android and iOS smartphones, and with peripherals like the Vive, Oculus, Oculus Go, Microsoft HoloLens, and the Gear VR. This is a much wider scope of compatibility and clothing options than haptic wearables we’ve seen before that are isolated to a vest, a pair of gloves, or are a full suit that’s inseparable from other parts of the body. HoloSuit’s VR-friendly smart clothing line is taking note of what other haptic and tracked wearable makers haven’t done. They’ve made their tech into a jacket, gloves, pants, athletic jersey, headband, and even includes a clavicle and foot tracker. Each of the clothing pieces can be worn together to have full body tracking or can be worn as separate pieces to track individual sections of the body. If you’re an Oculus person, say sayonara to floating ghost hands! The jacket and jersey track the same thing, upper body movement, while the gloves track each individual finger and are equipped with buttons on them for added control of your virtual avatar. The pants track the range of motion of the lower body which also includes different leg angles. The headband tracks head movement, while the clavicle extension tracks the shoulder and the foot trackers keep tabs on the movement of the feet or shoes. Developers interested in turning the suit into a full body VR, AR, and MR controller should keep an eye out for their SDK coming out soon. Each of the HoloSuit’s individual clothing pieces is equipped with full body haptic feedback, or the simulated feeling of touch or impact in virtual or augmented worlds, that can also capture real-time body motion with Bluetooth and the right set up. Their backers have an option to go for the suit with 26 total sensors at $999.99 or super splurge on their top tier model with 36 sensors at $1,599. Please check their Kickstarter for individual backer rewards, the higher the amount you give the more of the suit you get. Each jacket or jersey and pair of pants has 9 haptic feedback locations placed at the special locations along the arms and legs. The more HoloSuit clothing you wear, the fuller the motion tracking and data collected will be. 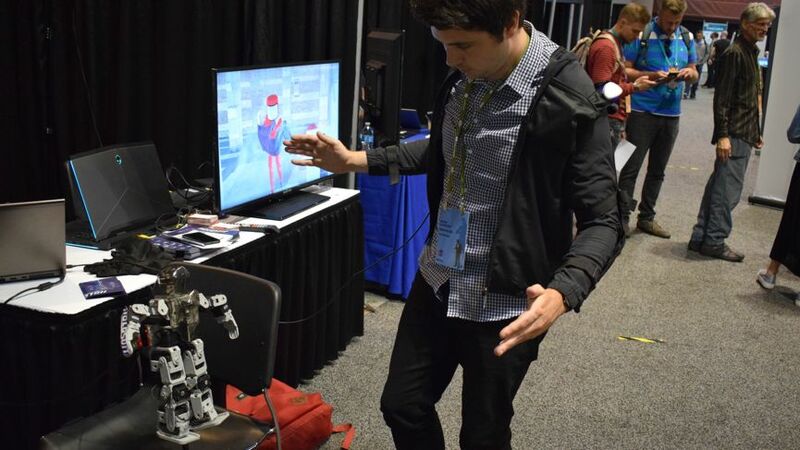 Wearable’s Hugh Langley tried out their tech at AWE 2018 and danced the robot as he willed a robot to dance along with him, which is a great example of what the tech can track and transfer movement to other objects. The gloves fingers have haptic sensation exciters, gets tracked, and can be used to interact with virtual and augmented experiences with 6 buttons. So, they’re ditching the regular Vive wands or Oculus touch controllers and are replacing them with your own gloved hands. Grabbing, touching, throwing, and even breaking objects in VR or AR could be just what the industry is looking for to make VR and AR more immersive. Being able to move your hands more naturally will undoubtedly increase embodiment even more in VR. Wearable smart clothing needs to be flexible, comfortable, and breathable if it’s going to be successful in the fitness industry. The HoloSuit is washable and designed to be a long sleeve and pants combo, which is great as a first generation suit, but I worry that it might make some athletes and active individuals uncomfortable if they are exercising in it for an extended time. I haven’t tested it myself, but the tracked jersey looks like it’s a better option for active folks that don’t want to feel like they’re wearing an actual suit. Publications like SportTechie say that you can wear the smart clothing while playing golf, practicing yoga, and even while doing karate! These are activities that require the suit to wirelessly follow your body’s location, to track and keep data about golf swings, posture and yoga poses. If the tech can be used with a trainer to give you added support during a karate workout, it potentially can track data and provide a sensation of force impact in boxing or other sports in VR. For the HoloSuit to be able to do this with such accuracy is amazing to me, however, I really want to see how it stacks up with their backers. I’d personally like to see how Oculus owners use the HoloSuit because Vive already has full body tracking. Getting accurate body tracking while playing a VR cricket, soccer, or dancing and rhythm game can mean more body movement and an increase in calories burned during each game. Once studios and devs start bridging compatibility with VR and AR games, controllers and buttons will be used less to simulate the movement and will be replaced with actual soccer kicks or dance moves. See HoloSuit’s full body movement in yoga below! You can find HoloSuit on their website, Kickstarter, Facebook, Twitter, YouTube, and LinkedInpages. At the 2018 Augmented World Expo, tucked away at the back of the Santa Clara Convention Center, a very small robot was learning to dance. I know so because I was the one teaching it, simply by flailing my limbs around and having it mirror my movements. I was literally doing the robot. This was all happening because of a (slightly-too-small) jacket on my back called the HoloSuit, which was covered in sensors. These sensors tracked every movement and relayed that information to a tiny robot stood nearby, doing its best to pop and groove in time. The HoloSuit, created by Kaaya Tech, is actually three bits of clothing that can be worn separately or combined: a jacket, some gloves and a pair of pants. There are two versions of the full-body suit, one with 26 sensors and a more high-end version with a total of 36 sensors scattered across the jacket gloves and pants. Even 26 is a lot when you compare it to other motion capture bodysuits; 36 should make for some pretty incredible precision. Both suits also have nine haptic feedback sensors, and buttons on the hands, opening up a host of other possibilities beyond motion capture. For example, Kaaya CEO Harsha Kikkeri showed me a video animation of someone in a submarine launching torpedoes at an unseen enemy. Going from dancing robots to literal war was quite an escalation, but it illustrated the varied spectrum of possible use cases. It’s not easy to train inside submarines, but the HoloSuit could be a way to simulate that environment, training people as if they were helming a sub beneath the depths. Or, it could be used to improve your golf swing. The suit could essentially replace a coach, using haptic signals to shake out your bad habits. As Kikkeri explained, you could then take the suit to the golf course and have it track your performance, giving you insight into your performance after. It may find a use for manual labor jobs to alert employees when they’re putting themselves in physical danger – or maybe for controlling robots sent into burning buildings. There are a lot of possibilities, including plenty of applications in VR and AR. Immediately I thought about using this as a full-body virtual reality controller. Harsha Kikkeri knows a thing or two about robots: he was a robotics software engineer for Microsoft for several years. Now he’s applying that expertise to humans, and the results are promising. The HoloSuit seemed very precise in my demo, even though I was only using the jacket part. Kikkeri then put on his own jacket showed me a computer character on the screen tracking his movements with even more exactness than the robot did. The HoloSuit is now on Kickstarter gathering funds, with an aim to ship the suit in November. Kaaya is offering all the parta a la carte, but the full suit starts at $799.